... 1565 (445 years ago today),"with many banners spread, to the sound of trumpets and salutes of artillery," according to a contemporary journal, a Spanish "general took formal possession of the country in the name of his Majesty" -- the country being what is now the United States. 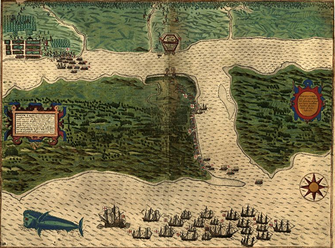 The landing took place at what is now St. Augustine (right), a city on the northeastern coast of Florida. (credit for 1589 map) The event marked establishment of the 1st continuously occupied European settlement in North America, then inhabited by the peoples now called Native Americans.